In the recent times, Malaysia have been plagued with outrage over the passing of Islamic Syariah Laws of HUDUD Punishment in the state of Kelantan with EVERY LAW MAKER in the state agreeing to the cause, with Opposition UMNO Members (of the Barisan Nasional or National Front) fully supporting the bill. The thing is, that the bill started off over 20 years ago when the late Haji Nik Aziz Nik Mat proposed this as part of the PAS Manifesto and with full support of the Palace, put PAS or Islamic Party of Malaysia into power for over 20 odd years. Now, even Melaka (Malacca) are mulling the move as how Brunei pushed for full Islamic Laws recently, despite having good support of fellow ally, Singapore. However, the Alternative Front or Pakatan Rakyat namely the DAP did not like the bill saying its barbaric and inhumane. However, lets put the perceptive of HUDUD and Syariah Laws into the legal place. In Singapore, there is only ONE LEGAL SYSTEM, Civil Courts Prevail and an act called Administration of Muslim Legislation Act or AMLA (not to be confused with Anti-Money Laundering Act) and Syariah Courts have the absolute power of laws pertaining to Muslims but let's put it in the LEGAL ASPECT. 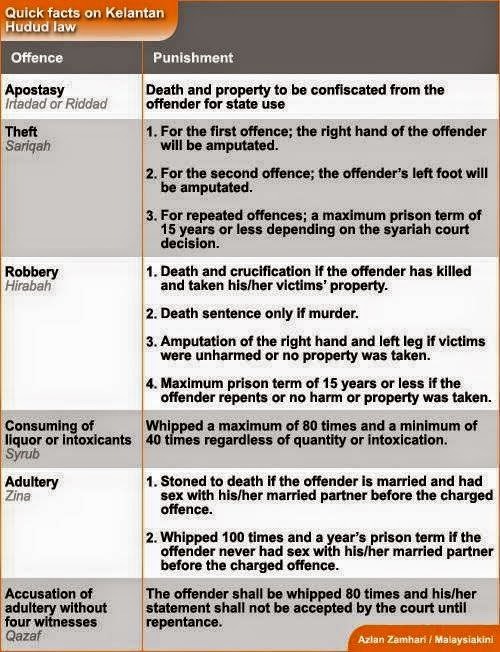 The descriptive above are from Malaysia Kini and compare against the current civil laws. Theft... is punishable by jail sentence or even whipping if harm is put to play, such as weapons or other factors and in Malaysia we look at 6 years jail for petty theft of shoplifting and in Singapore, a 6-12 months jail. However, if factors in play includes desperation, act of nature where supplies are hard to get etc, then the person is not at fault. In the UK, AGBH (abbreviated gross bodily harm) where yobs and hooliganism are caused by the drinks. Here in Singapore, if you are drunk and caused problems, it's jail time for you. Drunk Driving is a huge problem. So DRY OUT. False witnesses are also threaten with whipping same of False Police Report or Declaration. Saving on technology or just pure money? ?